North Philadelphia welterweight and future number one contender, Charley Scott made his professional boxing debut on this day in 1953. The bout was held at Philadelphia's "Blood Pit", the Cambria Athletic Club, with Scott taking a four-round decision over Steve Cole. Scott would go on to post an overall ring record of 34-32 (19 KO). 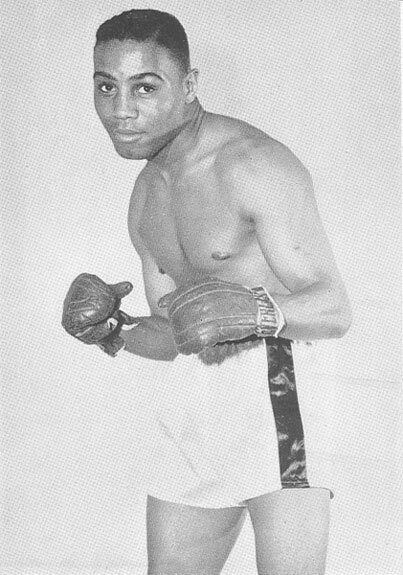 A popular east coast attraction during his 13-year career, Charley fought many tough foes including Gil Turner, Bennie Briscoe, Bennie Kid Paret, Isaac Logart, Jose Stable, Gasper Ortega, Virgil Akins, and in his most memorable fight of all, Garnet 'Sugar' Hart. His victory over Hart, a 9th round TKO on October 19, 1959 at Convention Hall, would bring him the Pennsylvania State welterweight title as well as the overall number one ranking in the worldwide welterweight division, but the fight itself was such a savage, grueling contest, that even he, the winner, would never be the same afterward. None the less, coming out on top in that epic bout, secured his place in Philly boxing history forever.